Today was our next to the last day of diving, so we decided to take full advantage and do three dives, two in the morning and one in the afternoon. Yesterday a new guest, Peter, arrived at the resort when Hinne left. Peter flew directly from Denmark so was a bit tired when he arrived yesterday afternoon and was not sure if he was going to feel like diving today. However, he said he slept very well and was ready to go out and do the first two dives of the morning. After we all had breakfast together, we left around 8 a.m. for the first two dives of the day. The first dive was at Fukui. I am running out of words to describe the dive sites. They are all so beautiful with lots of colorful coral and tons of fish and turtles. We had a very relaxing dive gliding along. 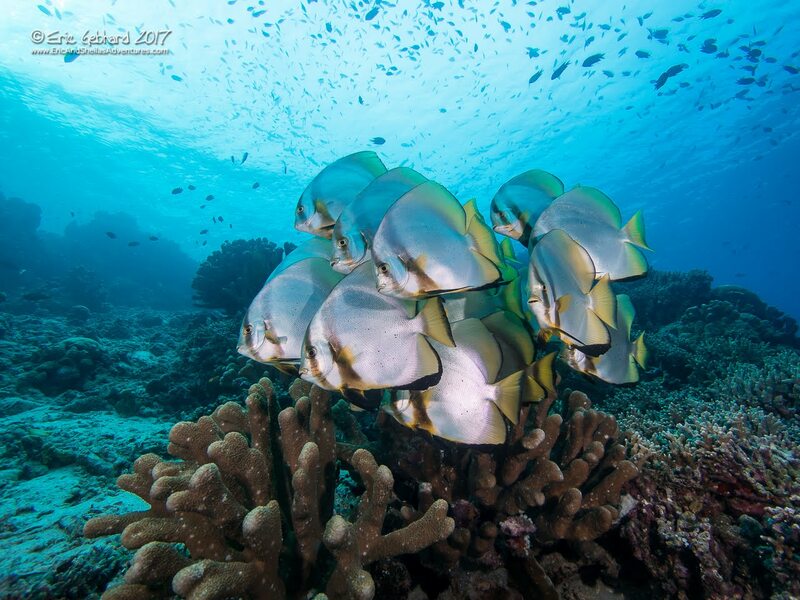 The second dive site was at Likuan 2, which we have done before, but is very nice also. Of course we saw more turtles than you can count along with tons of fish. This dive site got a little busy after we jumped in, but I’m sure it can get much busier in high season. We have just been spoiled having most of the dive sites completely to ourselves. After the second dive we made our way back to the resort and got cleaned up in time to have lunch at 1 o’clock. Peter decided he was going to take the afternoon off, but Eric and I were going to do the afternoon dive at 3 o’clock. Following a nice relaxing lunch and good conversation with Chi, Spencer, and Peter, we made our way back down to the dive shop to head out for our final dive of the day. Our last dive of the day was at Muka Kampung. It was another very nice wall dive. At several points during the dive we had some pretty good current, so we were flying down the wall with turtles coming at us from above and below and head-on. I have so much turtle video by now we could probably make a couple hour documentary on turtles. Eric had so many problems with his strobes on this trip he finally packed them up yesterday and called it quits on the photos. One strobe flooded and then the other one was having so many issues it only worked half the time, so he just decided to take the Go-Pro out today to get some boat shots and some shallow water shots when possible. Today was our last full day in Indonesia. I woke up this morning feeling like I might be coming down with a bit of a head cold, so I decided to skip the diving and just rest. After breakfast, Eric and the other guest, Peter, set off to do the two morning dives. They made the bit longer journey over to the other island, Manado Tua (the volcano-looking island) to dive two sites on the south side. Eric said the first dive site had a lot of current and the visibility was not great, but of course they still saw a ton of fish. The second dive site was a bit more relaxed with a lot less current and better visibility. At second dive site they saw two sea snakes hunting—which we had been wanting to see. After the two morning dives, they made their way back to the resort and we began the process of attempting to get all our dive gear dried out and start packing everything up. We will be taking a boat back to Manado, Indonesia tomorrow morning around 9 a.m. The boat ride can take anywhere from 30 minutes to an hour, depending on how rough the ocean is, and then it is about a 30-minute to an hour car ride to the airport, again depending on traffic. Since it is Easter weekend, we aren’t sure if the traffic will be light or heavy. Our flight leaves Manado airport for Singapore around 2 p.m. If everything is running on time, we should arrive in Singapore around 5:30 p.m. and we already have dinner reservations at the Italian restaurant we ate at and really liked, Rosso Vino. 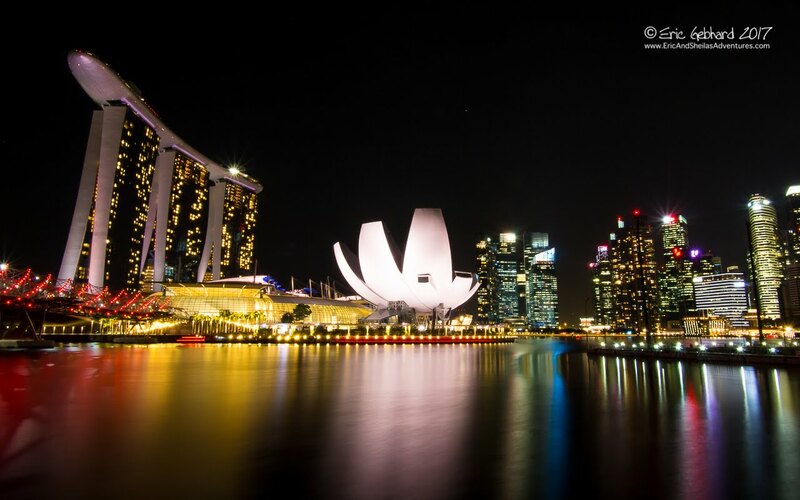 We will then be spending the night in Singapore and fly out the next morning for the 16-hour direct flight from Singapore to San Francisco. This vacation has gone by way too fast. Fish, fish, and more fish. Today we did three dives. Per the usual routine, we woke up around 6 a.m., got ourselves and the camera ready, and headed to the dive shop to analyze our tanks before heading to breakfast at 7 a.m. We have really enjoyed talking with Hinne, Spencer and Chi at meal times. Unfortunately, Chi was not able to join us for breakfast this morning as she has been fighting an ear infection which got worse during the night and she was in severe pain. Hopefully she gets better soon, ear infections are no fun at all. After another lovely breakfast and some good conversation, Hinne, Eric and I headed out at 8 a.m. for the first two dives of the day. This morning’s dives were at another island named Siladen. The first dive site was Siladen Utara and the second dive site was at the jetty at Siladen. They were both wall dives, as it the norm here. They were both very nice dives with tons of fish. The visibility was not the best on either dive as there was not really much current. On the first dive we saw a bunch of blue spotted stingrays and a ginormous trident snail that was eating a blue starfish. On the second dive we saw a huge school of mackerel along with all the other macro life like orangutan crabs, bubble anemone shrimp, soft coral crabs, black coral crabs, and the list goes on and on. The numbers and variety of fish here are just unbelievable. You usually don’t see just one fish of a certain type, it is generally in a huge aggregation. After the first two dives, we made the approximately 30-minute trip back to the resort. We arrived back around 12:50, so we raced up the 79 steps to our bungalow and had a quick shower before coming back down the dining area for lunch. We were scheduled to do a third dive today, so after lunch we headed back to our room to have a quick rest and download all the video off my memory card in my camera before coming back down for the 3 o’clock dive. On the second dive I maxed out the memory card in my camera, so was unable to get any video of the ribbon eel at the end of the dive. Hopefully, we will see another one as that was the first one we have ever seen and now we have no proof! I’m sure we will see another as they are apparently fairly common around here. The third dive was at Likuan 2. We again saw tons of fish and lots of macro life, some dogtooth tuna, but at the end of the dive we came across a VERY cooperative turtle who was positioned perfectly for me to video. I got a very long and very close-up video—probably the best turtle footage I have ever gotten. It was the perfect end to the last dive of the day. We made the short five-minute trip back to the resort and up the 79 steps to our bungalow to get cleaned up, download video, and then make our way back down to the dining area for dinner at 7 p.m.
Lazy days…Yesterday I took the day off from diving. However, Eric went out with Hinne and did three dives. They did Likuan I, Alung Banua, and Likuan III. The first two dive sites were on the morning dive and the last dive site was a night dive. I believe Hinne said he had only done one other night dive before since he had learned to dive, so he decided to try another one and he really enjoyed it. There was apparently very little current, which was nice, and of course lots of crabs and shrimp and eels come out to hunt for dinner after the sun goes down. Today, Eric, Hinne, and I went out for the two morning dives with our guides, Eric and Winston. Our first dive was at the adjacent island (Manado Tuo) at a dive site called Negeri. The coral reefs around the island are very beautiful. We did a relatively short shallow dive along the top of the reef, which was really beautiful. We saw a leaf scorpionfish, mackerel, orangutan crabs, about three or four different types of shrimp, and I think this one reef must have about a quarter of the worlds anemonefish. I swear there was an anemonefish every two to three inches for as far as you could see. I don’t think I have seen anywhere near that many anemonefish in all my years of diving combined. The second dive was at Likuan. I decided to sit this one out and had a little nap on the boat while Eric and Hinne went diving. I guess there was quite a current at this site today and they had a fun ride whizzing along the reef. Apparently, as with most dive sites, they saw turtle after turtle as well. After the dive we returned to the resort. It was full moon yesterday and the low tide this morning was quite impressive. When the tide is that low, they can only get the boat a short way into the bay and then you have to get out walk quite a distance to get up to the resort. It is an interesting walk, though, as you get to see all the starfish and hermit crabs wandering around. Another two days of diving under our belts. Yesterday we did three dives, two in the morning and one in the afternoon. They were all really nice dives with lots of colorful coral and marine life. We dove Mike’s Point, Mandolin, and Fukui. There are turtles everywhere here. We saw a big school of bat fish that were very cooperative and Eric was able to get a couple good photos of them. Today we woke up and the ocean in front of the resort was like glass. The last few days it has been a bit choppier but nowhere near being considered rough. We did two dives today after breakfast. There was finally another guest at the resort, so the three of us, Spencer and our guide, Eric, headed out for the first dive at 8 a.m. The dive site was only a short distance from the resort and it was a nice relaxing dive with not much current. Our guide, Eric, pointed out lots of macro life, like orangutan crabs, nudibranchs, shrimps, etc. Most of it was too small for me to see--even with my new bifocal dive mask. We finished the dive and got back on the boat. The other guest that was diving was already back on the boat and apparently had had some issues with his ears being slow to clear, etc. He decided it was wise not to do the second dive, so the boat captain took him and Spencer back to the resort. We headed out for the second dive which was again a very short distance from the resort. After our surface interval, we dove in. This was again another nice, relaxing dive with lots of macro life (along with the turtles). Eric had been having some issues with one of his camera strobes not working properly on the first dive, so he decided not to take his camera on the second dive. I had my camera with me and we decided to put the tripod on it to see if that would help stabilize some of the shots. The camera is still very new to me and it has obviously been a while since the last dive trip, so I am still getting used to using it and how to get the best shots. After a lovely dive, we headed back to the resort for lunch and to relax. After lunch, we headed to our bungalow and had an afternoon nap. Then Eric got up and did some work (have to pay for the trip somehow) and then handed the computer over to me to type up the blog. We got up around 6 a.m. in order to eat some breakfast and get ourselves ready before making our way to the airport. We headed down to the reception desk around 7:30 a.m. in order to check out and catch a taxi. It did not take long to get to the airport and once there, we made our way to the Silk Air check-in counter to check in for our flight to Manado, Indonesia. Once we were checked in, we headed downstairs to the MRT ticket booth in order to turn in our 3-day Tourist Pass cards and get our $10 per card refund. The ticket booth opened at 8 a.m., so we only had to wait in a short line for a short time. We then made our way back upstairs and through passport control and went to find our departure gate. The Singapore airport is set up a little differently from most airports. You actually don’t go through security until you get to your gate. We found our gate and since we had some time before the gate opened for our flight, we wandered around a bit and got something to drink. After some wandering, we decided to head back to our gate, went through security and sat down for a bit before they starting boarding the plane. It wasn’t even close to a full flight, so we got lucky and had an aisle and a window seat in the exit row with no one between us. It was about a 4-hour flight to Manado. We were still booked for a vegetarian Indian meal on the flight, so not long after take-off they served the food. It was actually a very tasty meal with cauliflower and paneer with just the right amount of spice. Dessert was even better—chocolate covered vanilla ice cream! 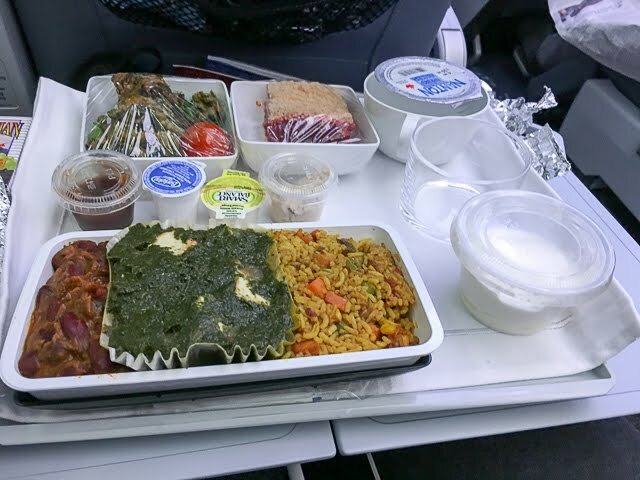 !—you won’t get that kind of food in coach on a 4-hour domestic flight in the U.S.! It was a smooth flight to Manado. We made our way off the plane and through passport control, which did not take much time at all. Waiting for our baggage was another story—they obviously aren’t the fastest at unloading the bags from the plane. After a bit of a wait, we collected up our three checked bags and made our way to the curb where someone was to be waiting for us. 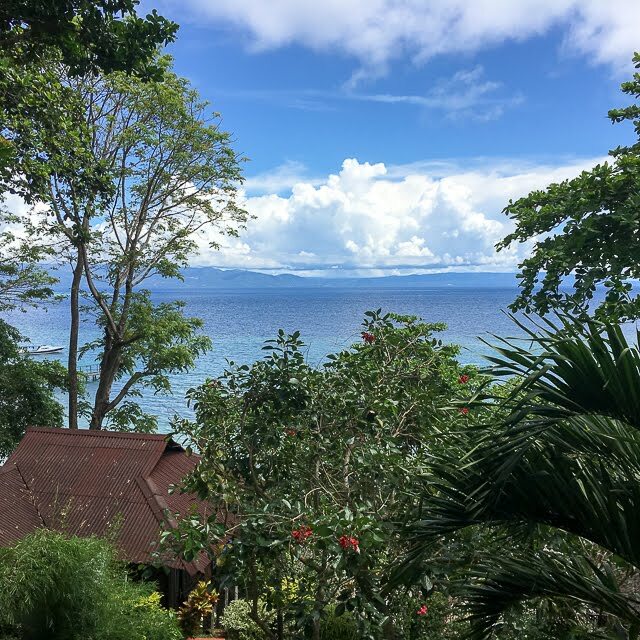 We finally located our driver, who loaded us and our luggage up and drove us about 35 minutes across the city in very busy (Filipino style) traffic to the boat which would take us to the island of Bunaken. The boat ride was a bit bumpy leaving Manado headed for Bunaken, but gradually smoothed out. It was about a 45-minute ride. Once we reached the island, we were greeted by Spencer, one of the resort managers, who escorted us to the resort where they had a welcome drink (my favorite—Mango juice) waiting for us. After we filled out our dive paperwork and some other paperwork, we made our way to our bungalow on the top of the hill. It was a bit of a hike, so you don’t want to forget anything and have to go back up the hill too many times. I’m hoping it will burn a few calories, though. Once in our room, we got busy unpacking all our dive gear and Eric got the cameras set up for the two morning dives the next day. By that time, it was about dinner time. The meal times here are 7 a.m., 1 p.m. and 7 p.m. We made our way down to the dining area and enjoyed some good conversation a very good meal with the property managers, Spencer and Chi. At the moment we are the only two guests at the resort. We finally made our way back up to our room around 10 p.m. and crawled into bed. We sat our alarm for 6 a.m. the next morning so we could get up in time to go down to the dive shop and analyze our tanks before breakfast. The dive boat was scheduled to leave at 8 a.m. for the first two dives of the day. After a wonderful breakfast with Chi and Spencer, we all boarded the boat for the short 10-minute ride to the first dive spot. The first site was one of the few spots with a slope. It made for a good site to do the first dive to get back into the swing of things. There were tons of fish. We discovered the currents here are very strange. One minute it is going one direction and the next minute it is going the other direction—making the dive profiles a bit interesting. However, the local guides are very good and know exactly which way to go and when. After our first dive and our one-hour surface interval, we made our way to the second dive site. This was a site with a wall, which is typical of most of the diving here. We dropped down onto a beautiful coral garden and then over the edge to the wall. The coral and fish life here is amazing. There are tons of every kind of fish imaginable and they are everywhere. We saw at least 8 or more turtles on this dive, along with a frog fish, scorpion fish, and all the other usual suspects. We decided to just do two dives today and relax in the afternoon. Normally, lunch is served at 1 p.m. and then the afternoon dive boat goes out around 2 p.m. for one dive. After a relaxing lunch, we wandered out onto the pier and saw a small spotted eagle ray along with masses of fish. We then headed back to our room and had a little afternoon nap—we are on vacation after all! Today was a VERY long day. We set our alarm clock to get up at 6 a.m. so we could get an early start. 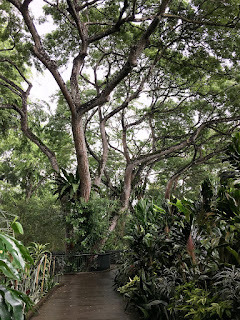 We had decided we would try to go to the Botanical Garden/Orchid Garden and then the Jurong Bird Park. However, we woke up at 6 a.m. to a massive thunderstorm and pouring rain. Unlike most tropical storms which are usually heavy but very brief, this one seemed to go on and on. The lightning and thunder put our worst monsoon storms in Arizona to shame. Needless to say, we did not leave when planned. We finally got going around 9 a.m. as it looked like the rain was just down to a drizzle by then. We made our way out of the hotel, through the shopping mall, and across the street to the MRT station for the ride to the Botanical Garden MRT stop. 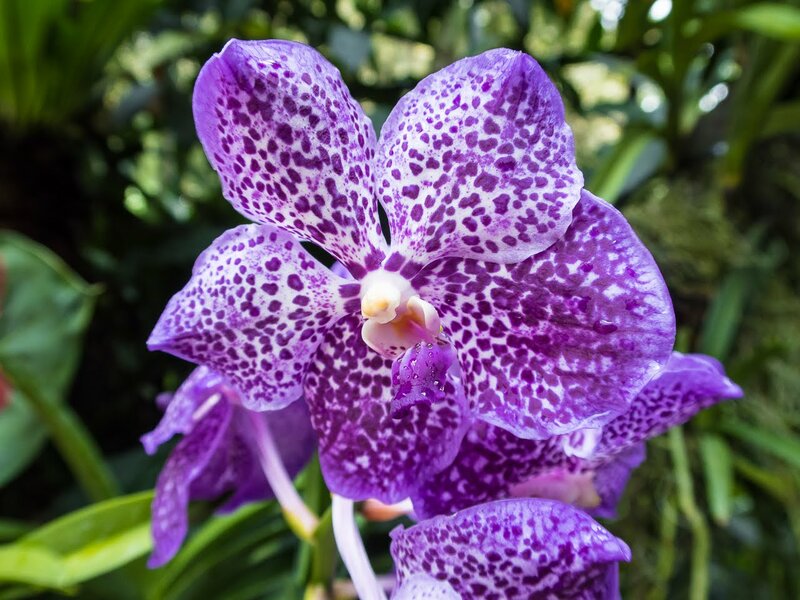 Getting around Singapore is incredibly easy using the MRT, and with the 3-day Tourist pass you get unlimited trips on most methods of public transport. In about 30 minutes or so we made our way across town to the Botanical Garden, which is listed as a UNESCO World Heritage Site. It is completely free to get in. If you like plants and flowers, I would highly recommend the Botanical Garden. 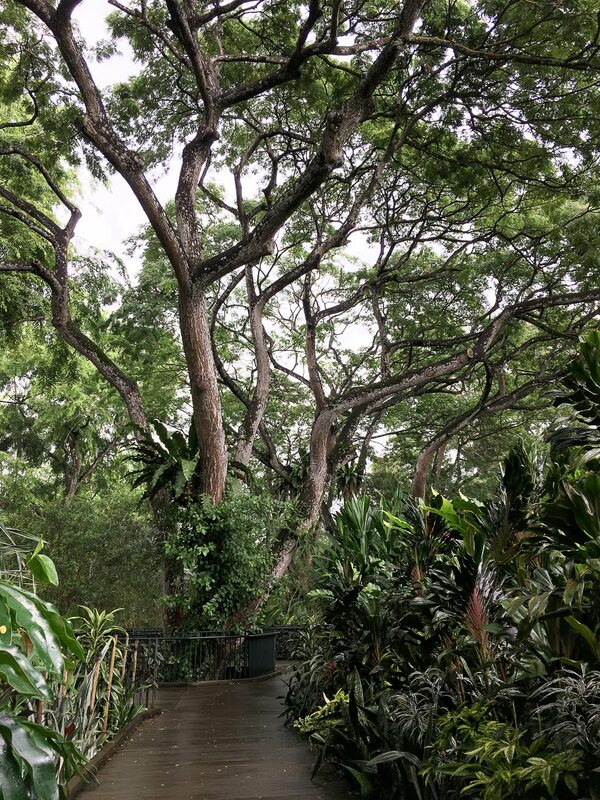 The garden is huge and you could very easily spend an entire day or more. However, if it is sunny out, I would highly recommend going very early in the morning. I believe they open at 5:30 a.m. We got lucky in that it was cloudy, bordering on very light showers, most of the time we were there. 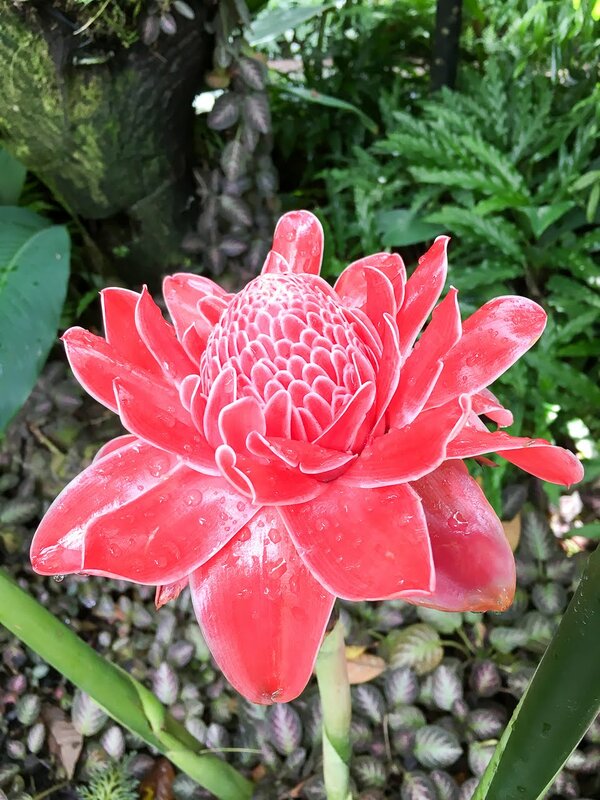 Unfortunately, the clouds did not last and about the time we got to the Orchid Garden (which I also highly recommend at S$5 pp) the sun finally broke through. It was so hot and humid I think Eric was about to pass out. 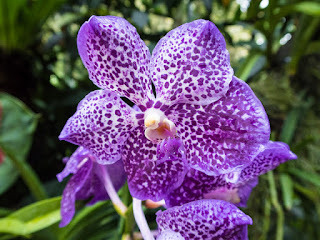 They do have one cool house for orchids on the premises and we made our way there to get a bit of relief from the heat. One thing you look for in Singapore on a sunny day is any place with air conditioning. After just about walking ourselves to death in the heat, we stopped at one of their on-site restaurants for lunch before heading back to our hotel. We actually sat outside to eat lunch as it was in the shade with ceiling fans and was cooler than eating inside (which we figured would be air conditioned, but wasn’t). We got back to our hotel and relaxed for a little bit before heading out for our late afternoon/evening adventure. 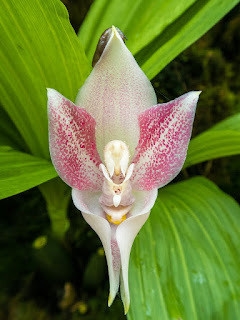 Eric downloaded the 260 or so photos that I took of all the flowers at the Botanical Garden (I’m a little picture happy). After a short rest, we headed out around 5 p.m. to make our way to the Gardens by the Bay. 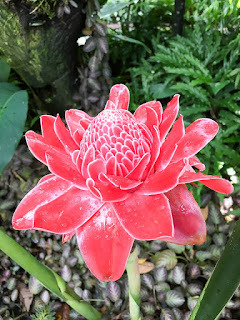 Last time we were in Singapore we visited the Gardens by the Bay during the day and again it was a sunny day so it was so hot and humid outside we really could not wander around for very long. However, they do have several huge indoor air-conditioned domes which we visited—which were wonderful as well as being cool. 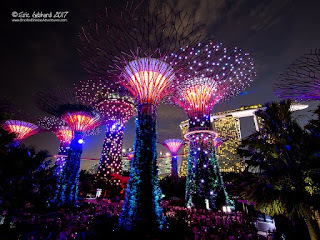 This trip we wanted to visit in the evening in the hopes that it would be a bit cooler as well as we wanted to see their free light and sound show in the Supertree Grove, which we had heard was quite spectacular. We wanted to make sure we got there before sunset so we could scope out the best vantage point for photos, as well as get some dusk photos. After a bit of wandering around, we found a pretty good spot and staked our claim. Then it was a waiting game for the sun to go down. It was a bit hot waiting, but as soon as the sun started setting, it was not horrible. The sunset was around 7:11p.m. and the first of the two light shows starts around 7:45 p.m. Eric sat up his camera on a little Gorilla tripod we had with us and put it on a fence post. Once the show began, Eric commenced the picture taking process using a longer exposure and I took a few videos and attempted to shoot pictures (not nearly as good as Eric’s). After the light show ended, we decided to wander around the Gardens and see if we could find any other good night-time picture spots. By that time there was a nice breeze and it was actually almost enjoyable to wander around. 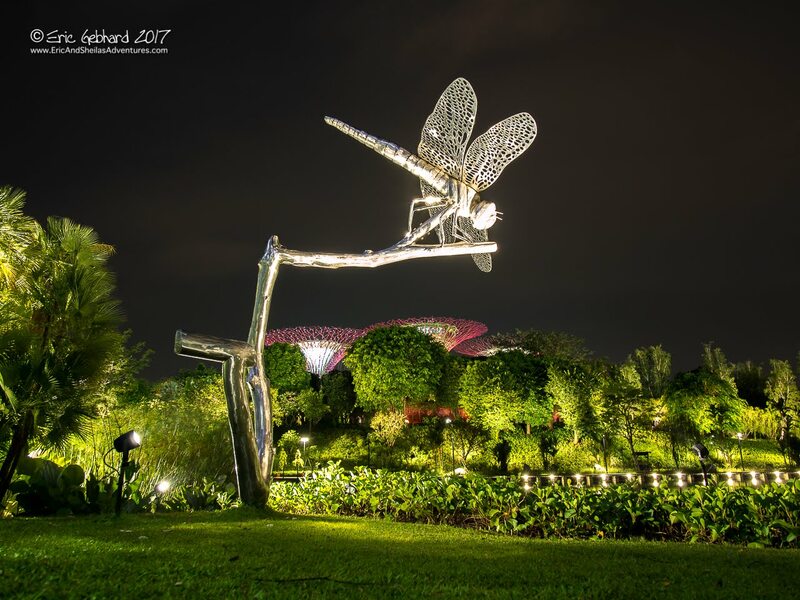 By one of the lakes, we found a large metal dragonfly sculpture that was lit up with the Supertrees behind it in the background. It was also a good vantage point for a shot of the Marina Bay Sands. We found another spot that wasn’t bad for a picture of the Singapore Flyer (giant Ferris wheel). 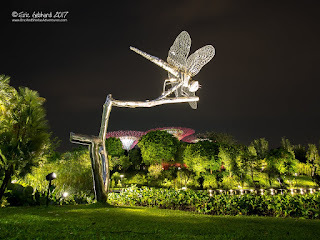 After we thought we had about all the photos we could get in the Garden for one night, we headed over to the Double Helix bridge near the Marina Bay Sands. Unfortunately, the football stadium which is adjacent had its massive flood lights on, which pretty much ruined most of the picture taking. We wandered down the helix bridge for a while and finally they turned the stadium lights off. Eric got some really good pictures of the helix bridge, Marina Bay Sands, the city skyline, and the ArtScience Museum. I don’t know about Eric, but my calves were about to moo they hurt so much from walking and being on our feet all day. When we finally decided to head back to our hotel, it was approaching 10 p.m. (way past our bedtime, Ha!) By the time we got back to the Expo MRT stop where our Hotel was located, the mall was actually closed, so we had to walk all the way around the building to get to the front door of our hotel—I thought my legs were going to explode. After our approximately 9-10 miles of walking around the city (we tracked it on Eric’s Strava), I was ready to take my shoes off and put my legs up when we got back to our hotel room. Eric was anxious to check out the photos he took, so he got his computer out and got busy. I was so tired, it was all I could do to crawl into bed and pass out. I did not even hear Eric come to bed some time after midnight. We thought we might go to Sentosa Island tomorrow, but since we were out so late, we decided we would have to reevaluate in the morning. We got up around 7:45 a.m. and Eric did some work. We looked at some of the photos we both took the day before and we lounged around until around 11 when we decided we would do some laundry. It was almost completely clear out and thus extremely sunny and probably beyond unbearable outside. I think that pretty much determined the fate of going to Sentosa Island. In that kind of weather, about the only things bearable to do are in the air conditioning. 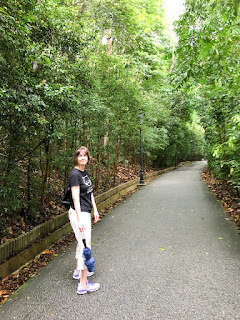 We rationalized not going out and doing much by telling ourselves we needed to save something to do for the next time we come to Singapore--the Jurong Bird park and Sentosa. It was around 2 p.m. by the time we finished our laundry, so I started the research on places to eat. I decided Italian sounded good and I found a place on TripAdvisor called Rosso Vino which was in Robertson Quay near Clark Quay. It was a ways to travel for food, but there is nothing really around our hotel in the business district (other than the mall and the mega grocery store). So we started the trek across town on the MRT and then walked about a 3/4 of a mile to get to the restaurant. Needless to say, it was not a cool walk by any means. We were the first patrons of the evening. It was mostly an open-air restaurant; however, they had an air conditioned area which we gladly occupied. 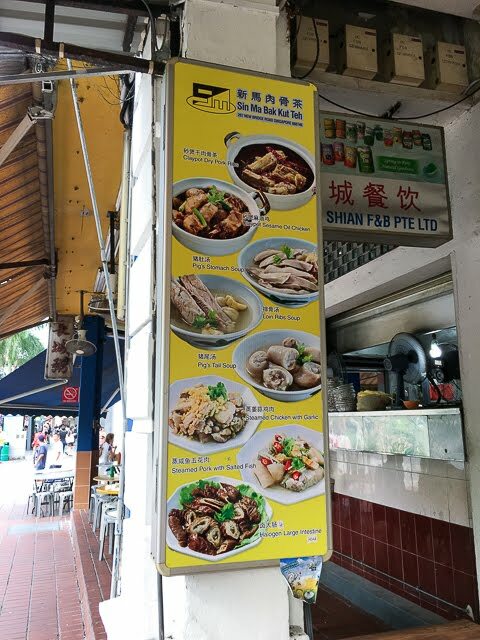 We made a very wise choice with this restaurant, as it was the best meal we have ever had in Singapore. It was so good, we already have plans to stop there on our way back from Indonesia. After dinner, we walked around the area a bit to see what was around and then walked back through Clark Quay to the MRT station to begin the trek home. Unfortunately, we picked rush hour to make our way back. The one train we had to ride on for about eight stops was absolutely packed. We were pretty much wedged in like sardines. 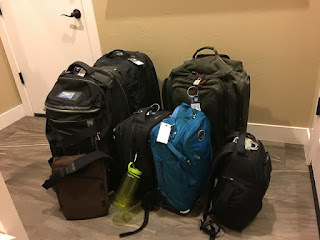 We finally made it back to the hotel and after posting the blog, got busy packing our luggage for the trip back to the airport tomorrow morning for our 9:45 flight to Manado, Indonesia. Luckily we were able to get all our luggage packed and all our errands run early enough on Thursday in order to get to bed by about 8:30 p.m. It was an early morning on Friday. We got up around 2:50 a.m. in order to eat a little breakfast and be ready for our 3:45 cab ride to the airport. We flew out on United and obviously terminal 2 was not busy at that hour of the morning. It was one of the fastest security lines we have gone through. There was absolutely no one in line and with our TSA pre-check we just walked up, threw our luggage on the belt and walked through the metal detector. After we were through security, we headed to the United Lounge to hang out for a little while before our flight. When it was time to board our flight to San Francisco, we headed to the gate. We got upgraded to first class for our flight from Phoenix to San Francisco, but unfortunately there was some crazy old lady that sat in the seat directly across from me. She was extremely loud and obnoxious, but luckily once we took off she pretty much fell asleep for most of the flight. We made it to San Francisco and had several hours to kill before our flight to Singapore. We went to our gate and exchanged our United boarding passes for Singapore Airlines boarding passes and then headed out into the terminal to look for something to eat for breakfast. There isn’t much to eat in the International portion of the terminal, but we managed to find a place that served breakfast potatoes and bagels. After eating, we then headed to the Singapore Airlines lounge to hang out. 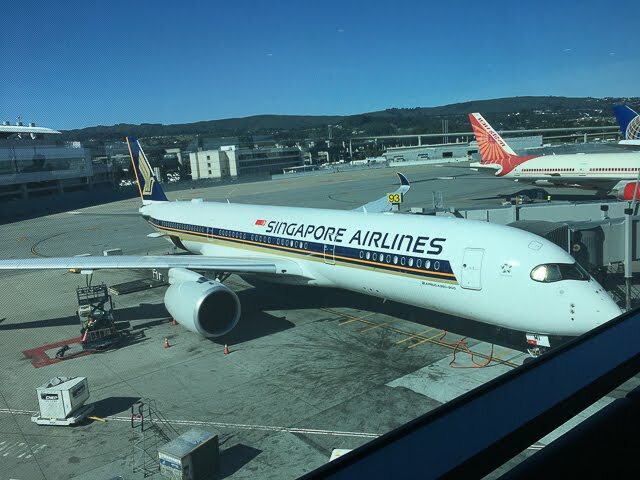 We had approximately three hours before our flight to Singapore departed. We hung out in the lounge with some of the crew for Carlos Santana. They had a concert in Singapore on April 4. As it got closer to time to board our flight, we headed down to the gate. We flew premium economy this time, which is kind of like domestic first class. The seats are a little nicer with a foot rest, etc. and more leg room. We departed on time and began the nearly 17-hour nonstop flight. It was a long 17 hours. As soon as we took off, I started my nearly 16-hour movie marathon. I watched one move after another until about an hour before we landed. I didn’t fall asleep until about an hour and 30 minutes before we were scheduled to land. We were served two meals and several snacks during the flight. We had ordered the Indian vegetarian meals. They were very tasty, but a bit on the spicy side. I hardly ate any of the second meal because I really wasn’t that hungry. Other than being very long, the flight went pretty smoothly except for the fact that there were about six small children seated just behind us in coach that screamed and cried excessively during takeoff and landing and a good portion of the rest of the flight as well. It didn’t bother me too much as I have learned to tune out pretty much anything and Eric had his noise-cancelling headphones so it didn’t bother him much either. Once we landed in Singapore around 7:15 p.m., we made it through passport control and headed for the MRT station to see about getting some 3-day Tourist Passes. We double checked at the information desk and she told us if we purchased them now they would consider it the first day (which was already gone). So we decided to just catch a taxi to our hotel and come back tomorrow to get the passes. At the time of night we arrived, the airport wasn’t busy, so we did not have to wait long for a taxi. Our hotel is very close to the airport, so it was just a short ride. We got to our hotel and got checked in. After dropping our luggage off in our room, we headed next door to the shopping mall which is connected to the hotel to see if we could find something to eat for dinner. We didn’t see anything too exciting, so we hit the grocery store and got some almond milk and cereal for breakfast in the morning and then came back to our room and ordered a pizza via room service. The Capri hotel is the same one we stayed in four years ago when we were in Singapore. It is more of an apartment style hotel where the rooms have their own kitchen with stove, sink, fridge, microwave, and dishes. After we ate dinner, we crawled into bed and had no trouble falling asleep. I haven’t been so happy to see a bed in a long time. It felt really good to be able to lie down. After a good night’s sleep, we got up around 7 or 8 o’clock and Eric did some work on his computer and I researched what we wanted to do while we were in Singapore. We were a bit on the lazy side today, so we didn’t get going until around 1 o’clock. We caught the hotel shuttle to the airport so we could get our tourist passes for the subway and then rode the subway back to our hotel from the airport. Again, upon walking through the shopping mall on the way back to our hotel room, we weren’t able to find anything decent to eat, so we came back to the hotel and had lunch in the restaurant. After lunch we decided we would head to Chinatown to do some souvenir shopping. Last time we were in Singapore I bought some hand-made items from a woman there. I had no idea if she was still there or if I could find her stall, but I got lucky. 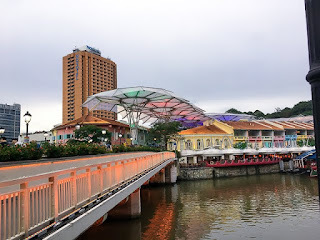 After getting my souvenirs, we decided to walk down toward Clark Quay (along the river). We walked down to the river and walked along the area with all the restaurants and shops. It was approaching dinner time, but neither one of us was really hungry after having a late lunch. We ended up sitting on the patio overlooking the river and just ordering a snack and a couple drinks. After enjoying our drinks, we headed back to our hotel after our nearly 4 miles of walking for the afternoon. As soon as we got back to our room, we were both ready to crawl into bed. As soon as Eric’s head hit the pillow, he was out.